To mark the Count Basie Orchestra's silver anniversary in 1960, Roulette Records released a double album comprised of updated versions of many of the band's classic recordings from those twenty-five years. This double-disc set, one of two issued by Roulette to commemorate the hundredth anniversary of Basie's birth (the other is Count Basie & Friends ), embodies the twenty-six songs renovated during those sessions in 1957-60. As most of the old arrangements had been memorized by the band, and others were "head" arrangements that had never been written down, tenor saxophonist Frank Foster was given the task of listening to the classic Basie recordings, transcribing them and assigning solos to the appropriate players. On the revised versions, Joe Newman takes most of the trumpet solos, Henry Coker is heard most often on trombone, and Foster (sitting in for such greats as Lester Young, Herschel Evans and Buddy Tate) is the principal tenor soloist. (Billy Mitchell is featured on "Broadway," "Every Tub" and perhaps a few othersit's hard to say.) Seventeen of the themes were originally recorded by the Basie orchestra in the '30s, eight others in the '40s, and there is one"Moten Swing"that predates the Basie band, having been recorded in December '32 by Bennie Moten's Kansas City Orchestra with the Count at the piano. 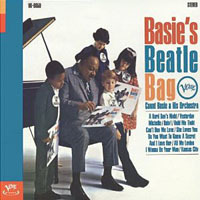 Unlike Count Basie & Friends, which headlined performances by a number of well-known guest vocalists, The Count Basie Story is largely instrumental (disc one entirely so). On disc two, blues singer Joe Williams is heard on four numbers. Although most of the stalwarts from the early years were gone, the Basie band in '57-60 boasted such blue-chip players as saxophonists Foster, Mitchell, Marshall Royal, Frank Wess and Charlie Fowlkes; trumpeters Newman, Thad Jones, Snooky Young and Sonny Cohn; trombonists Coker, Al Grey and Benny Powell; guitarist Freddie Green, bassist Eddie Jones and drummer Sonny Payne. And they do a splendid job of recreating such memorable themes as "Lester Leaps In," "Topsy," "9:20 Special," "Taps Miller," "Jive at Five," Doggin' Around," "Tickle Toe," "Dickie's Dream," "Swingin' the Blues," "Down for Double" and many others. The sound throughout is quite respectable, the playing times much less so (Roulette could have omitted one number and housed the entire session on a single disc). A short Story indeed, but one that is on the whole worth hearing again. Track Listing: Disc 1 -- Broadway; Down for Double; Lester Leaps In; Topsy; Jumpin' at the Woodside; Taps Miller; Shorty George; Doggin' Around; Avenue C; Jive at Five; Rock-a-Bye Basie; Moten Swing (41:01). Disc 2 -- Swingin' the Blues; Sent for You Yesterday; Tickle Toe; Blue and Sentimental; Time Out; 9:20 Special; Red Bank Boogie; Every Tub; Dickie's Dream; Texas Shuffle; Out the Window; Boogie Woogie (I May Be Wrong); Good Morning Blues; Gee Baby, Ain't I Good to You (44:00). Personnel: Count Basie, leader, piano; Sonny Cohn, Thad Jones, Snooky Young, Joe Newman, trumpet; Henry Coker, Al Grey, Benny Powell, trombone; Marshall Royal, alto sax, clarinet; Frank Wess, alto, tenor sax; Billy Mitchell, tenor sax, clarinet; Frank Foster, tenor sax; Charles Fowlkes, baritone sax; Freddie Green, guitar; Eddie Jones, bass; Sonny Payne, drums. Additional personnel -- Joe Williams, vocals; John Anderson, Wendell Culley, Jimmy Nottingham, trumpet; Bill Hughes, trombone; Eddie "Lockjaw" Davis, Seldon Powell, tenor sax; Gus Johnson, drums.